I had a fear of missing out before FOMO was invented, and I was feeling it acutely as I packed my bags to attend what would be my last summer at sleep-away camp, smack in the middle of high school. Going away for a month meant missing out on time with my friends and, while I was never one of the popular kids, I was lucky in my enormous, suburban high school for that to never have mattered. I was part of a tribe, and my tribe was made up of smart, caring, and creative nerds. The entirety of my social world revolved around the theatre, and that meant that in our group there were singers and dancers, poets and painters. Weekdays after school we built sets and attended rehearsals. Weekends meant trips to the Renaissance Faire (in costume, naturally) or gathering in somebody’s basement or backyard where we strummed guitars and sang songs by The Beatles and Simon and Garfunkel, laughing and rehashing elaborate inside jokes. While some may scoff at what was, admittedly, an incredibly wholesome set of hobbies for a group of teenagers, I will say without reservation that the unconditional affirmation I felt within our nerdy little tribe made my teenage years something I look back on fondly. We didn't expect one another to be anything in particular, except excited about something, regardless of whether that something was gaming, Shakespeare, physics, or photography. Within our safe little bubble, we supported one another's idiosyncrasies and we made space for one another's quirks. And yes, we were, and are, quirky. I love that my high school boyfriend wrote my yearbook message in runes, for me to decode. I love that the four of us with September birthdays threw the most epic Star Wars themed birthday party imaginable. I love that there were endless games of Magic, The Gathering, and screenings of Monty Python. I’m especially grateful to have these memories this week, as my little tribe mourns the loss of one of its members. Steve Zapata I best recall as half of a duo. Dallas and Steve dressed in stagehand black every single day of the year. Two avowed geeks cloaked in trench coats, years before The Matrix made them the official misfit uniform. Steve was the quiet one, always ready with a bemused eye roll and a closed mouth smile in the face of Dallas' more outright shenanigans. Knowing that I was glum to be missing a summer of fun at home in an era when summer camp still meant snail mail, not e-mail, Dallas and Steve promised to write to keep me appraised of the happenings at home. A few weeks into my time away, I found in the camp mailroom a vacuum cleaner box with my name on it, sent by the only duo in my life mischievous enough to imagine: one care package to rule them all. Steve and Dallas had clearly made a trip to Costco, or possibly raided the pantries of our collected friends, as the thing was stuffed with assorted contraband junk food. While I'm sure that the high fructose-sweetened and sodium-loaded array was truly impressive, the thing that I remember best was a ziplock bag of homemade flour tortillas. It must have been Dallas' idea to include the 5x8 glossy photo of the two of them together, Men in Black-style, but the tortillas? I'm sure they were the contribution of Steve alone. I brought them to the dining hall. My friends and I ate them with butter. Steve is gone this week. The liver transplant he needed didn’t arrive in time. His departure is reverberating through our community, now largely captured online, and it is comforting to hear that he received the best care, that he knew how he was loved. Grief is perhaps the truest thing that any of us can feel, the other side of the coin of caring. I haven't seen Steve in years, but I grieve for the loss of him within the context of our community. I'm grateful to have known, in my high school years, this quiet, genuine, and thoughtful man. I’m grateful for that giant box of junk food, and especially for those soft tortillas. It is absolutely surreal to see my name on USA Today. Surreal and fantastic. Back in January Marisa of Food in Jars referred me for a gig writing about the best places to visit in this town I love. It was a huge project that forced me to think about Philadelphia from the perspective of a tourist and it made me fall in love with this gritty, imperfect, soulful place all over again. With a little planning, local growers keep kale, chard, and collard greens on the table year-round with hoop houses and greenhouses. Do you know somebody who loves to can? As a result, are you the lucky recipient of homemade jam, canned tomatoes, chutney, or pickles? Return the favor by picking up one of these lovely gifts for the happy homesteader on your list. Whether you mix up some spiced rum to slash in eggnog, or make up an Old Fashioned with cherry bounce, these boozy infusions make great gifts or lovely additions to your holiday season home bar. My suggestions for what to pick up at your local farmer's market this weekend. Ever been to a clothing swap? They're one of my favorite things. For the uninitiated, a clothing swap requires each participant to bring a bag (or several) of clothes that he or she is ready to part with. Maybe you loved the color of the skirt, but it was actually a weird length on you, or you adored the idea of a dress more than the actual fit. Maybe you bought a jacket that seemed practical, but then never wore it, or perhaps you're just tired of looking at something. Regardless, the thing that is truly satisfying about a swap is that you arrive with items you're ready to bid goodbye and, inevitably, you go home with at least a few things that are new to you. Sometimes they come with stories behind them, like the hand-sewn dress that was a school project made by your friend's textile designer friend, and they're always just as exciting as if you had gone shopping. Despite having attended at least two clothing swaps each year for the past several, I had never been to a food swap until last winter. Frankly, I think I was being kind of snobby about it. Like, why would I swap food with a bunch of other people when I'm such a great cook? I'm sure that it comes as no surprise: I was so wrong. Food swaps are roughly the same idea as clothing swaps, but instead of bringing items that are languishing in the pantry, participants bring a quantity of items they've made to trade for a larger diversity of items. Instead of working all summer to put up jam of every flavor and hue, swapping is a great way to diversify your own selection by trading your fantastic apricot jam for a jar of somebody else's scrumptious strawberry. And it's not just jam. I was amazed - and proven very, very wrong from my previous sentiments - to see at my first swap (organized by Philly Food Swappers) such an amazing variety. There were breads and baked goods alongside hummus, handmade butter, home-brewed beer, chickpea miso, honey, sausage, berry syrup, kombucha starter, infused vinegars, fermented green beans, preserved lemons, homemade soup with croutons, bitters, infused liquors, and even dry goods like fruit leather, crackers, granola and soup mixes. In recent weeks I've happily attended a second Philly Food Swap and another swap held at Eat Retreat and hosted by Jane Lerner, who runs BK Swappers. Conscious of the accomplished culinary contributions I saw at my first swap, I was excited about each of these, and I tried hard to bring things that, to me anyway, seem unique and appealing. I traded jars of San Marzano tomatoes canned with backyard oregano and basil, sweet corn picnic relish, and two kinds of salsa: black bean and corn, and peach jalapeño. The haul I brought home in exchange is just inspiring. A tall jar of Jane's Salty Pirate Caramel and a Mexican hot chocolate spiced fudge. Honey cardamom syrup, marinated red peppers, and tomato achaar by Chitra.I was even the lucky recipient of some of Amanda's tiny, rooftop grown purple tomatillos, which disappeared into a salsa before I even snapped their photo.There was homemade sriracha, fermented dilly beans, and pickled brussels sprouts, chai tea bread by Alexis, and spicy sweet caramel popcorn. Home-cured guanciale by Heather and, and professionally pickled beets, okra, and jalapeños. My already loaded pantry (basement) is even more jammed than before and I can't help but feel, even as we head into the holidays when a lot of my jars will disappear to new homes, rich in the creative and delicious work of talented people. 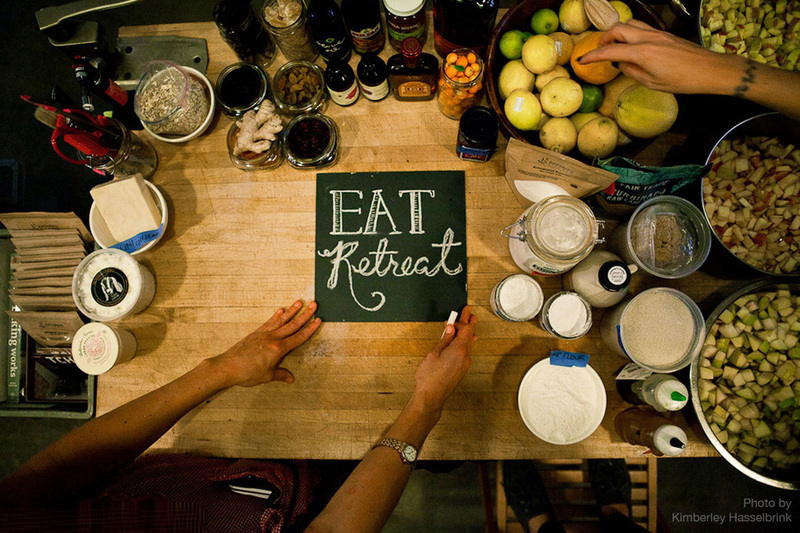 I'm bursting with excitement because in just a week I'll be able to skip town for a few days, make the [hopefully beautiful with bright autumn leaves] drive up to Watkins Glen, New York, and spend a few days immersed with other food nerds in the world of Eat Retreat! Thus far I'm a confirmed participant in a bread baking workshop and another on food radio recording, and assigned to a meal preparation team that is clearly going to show people how it is done. Expect extensive photographic coverage here. I'm sure that canning tomatoes would be easier with more than one set of hands, but two years in to my ritual and I think it might be something I just do on my own. Last August I lost a job and it broke my heart. It was the job that I had moved back to Philadelphia for and, while I really do love this place, it was an awful, sinking feeling to be suddenly untethered, yet encumbered by the lease I had signed less than a year prior, when everything I owned was still packed and ready to land anywhere. The months that followed have proved challenging, peppered as they have been with incredible firsts and terrible fears. They eventually led me to the place I am now: writing, storytelling, and striving every day to figure how to make a living at it in a shifting media world where even trained journalists are jumping ship. But back to the tomatoes. In those first days of unemployment I did exactly what you might expect: I watched television, but two days and an entire season of Portlandia in I had to come up with an alternate plan. For the first time ever I hauled my Presto pressure canner - the one I received as a Christmas gift years ago - out of the basement and sat down with the instruction booklet. Pressure canning is a little bit scary, after all. Who among us hasn't heard some awful story about a 1970's era pressure cooker exploding, pot roast sprayed across the kitchen ceiling? But encouraged by the safety release valves on my modern canner I soldiered forth. I canned them whole, with backyard basil and oregano, crushed, and sauced, the thick puree forced through my thrift store food mill. When the slicing tomatoes I had canned wound up with half of each jar as float, I opened them, drained them, and canned them again. 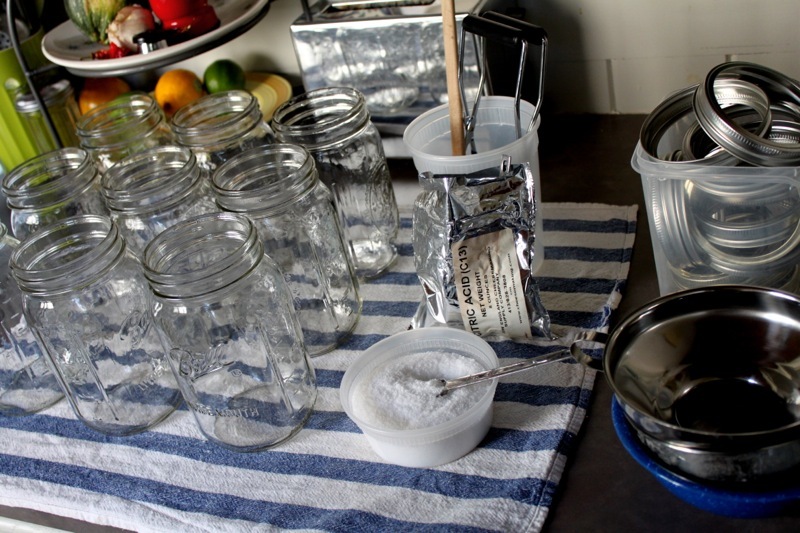 In the space of days, I went from pressure canning novice to wild canning machine. I could not be stopped. That year I canned three cases, sixty pounds, of tomatoes. Besides wine and the support of friends, of which there has been plenty, there's something meditative about canning tomatoes, and perhaps in any repetitive task, that, for me anyway, made it the ideal kind of work for a time when I needed to be soothed. Tumbling the fruit into the sink to wash, scoring the skin, blanching in boiling water, and removing to cool, slipping the skins off, stewing, milling, ladling, wiping, sealing, processing. Repetitive work, requiring focus, but also ample time to be alone with ones thoughts. I did it again this year, and while my thoughts aren't necessarily any more settled than they were a year ago, the tomatoes are still teaching me: that even our best plans don't always pan out, that the first frost will come eventually, that winter will be cold and lasagna is good, and that even when repetitive tasks feel less like meditiaion and more like drudgery, they too will eventually conclude. Figs are winding down for the year here in Philadelphia, but Giovanni is still fantastic. Here's a blog post about plum jam over on Serious Eats. At Foobooz this week we talked about Han Dynasty's new space, Garce-tober fest at Garces Trading Company, the Mucho Bueno Food Truck, and I was able to attend a preview dinner for Kevin Sbraga's new space, The Fat Ham.